This is a Basic vi Cheat Sheet. A small guide to help readers use vi editor more efficiently. This part contains the simple vi commands. Vi has two modes insertion mode and command mode. The editor begins in command mode, where the cursor movement and text deletion and pasting occur. Insertion mode begins upon entering an insertion or change command. [ESC] returns the editor to command mode (where you can quit, for example by typing :q!). Most commands execute as soon as you type them except for “colon” commands which execute when you press the return key. Nearly every command may be preceded by a number that specifies how many times it is to be performed. For example, 5dw will delete 5 words and 3fe will move the cursor forward to the 3rd occurrence of the letter e. Even insertions may be repeated conveniently with this method, say to insert the same line 100 times. 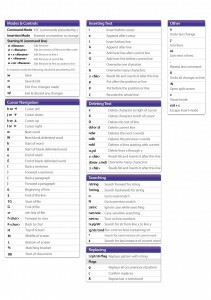 Download and print vi cheat sheet image. Stick it next to your desk and you’ll always have a quick guide to look at. Click on the image to get the full version. 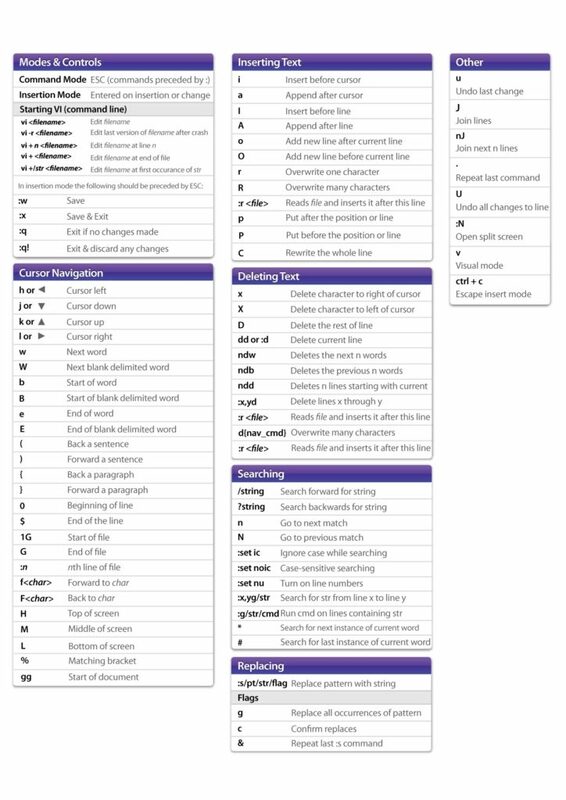 End of vi Cheat Sheet – Basic.